Cafe Casino is the latest gaming establishment from the famous group of US casinos that also operates Slots.lv, Bovada and Ignition Casino. Rolled out in April 2016, the casino is licensed and regulated by the Kahnawake Gaming Commission and is only able to accept customers from the United States for the time being. Accepting Bitcoin payments and offering over 200 realistic casino games, the gaming venue has the potential to become one of the favourite meeting grounds for US gamers. Cafe Casino features a very good welcome package for new customers, available immediately upon completing the registration process. $10 Free Chip – Use bonus code CHIP10 before making your first wager in the casino and you will be given $10 free to try out some of the casino games. However, bear in mind that the bonus comes with 60x playthrough requirement, with maximum cashout $125. After playing through your no deposit bonus, you have the option to choose between two first deposit offers. You can select Super Play Welcome Bonus and receive 500% bonus on your first deposit up to a maximum of $5,000, where deposit plus bonus amount is subject to 35x wagering requirement. Maximum cashout from the use of the bonus is 10x deposit amount. Alternatively, you can select No-Max Welcome Bonus and receive 100% bonus up to $1,000, where deposit plus bonus amount is subject to 25x wagering requirement. 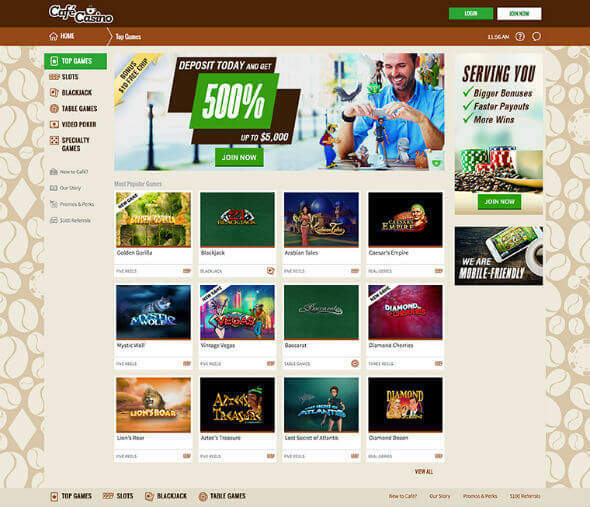 Considering that they are only able to work with US-friendly software providers, Cafe Casino chose the best of them, with their casino powered by Rival Gaming and Realtime Gaming, and available on desktop, tablet and smartphone. 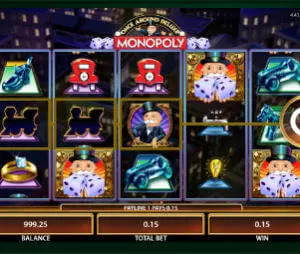 The casino houses an excellent selection of slots, including Rival Powered i-Slots that give players more control over the outcome, as well as Real Series slot games, feature-rich video slots and classic fruit machines. If you are after big wins, you should probably give Aztec’s Treasures, Major Moolah and El Luchador a spin, while other interesting titles at your disposal include Spy Game, Wild Safari and Cleopatra’s Gold. Those players who prefer table games will be glad to see six interesting Blackjack variants, European and American Roulette, Baccarat, Tri Card Poker, Craps and Caribbean Hold’em. While Credit Cards such as AMEX, MasterCard and Visa are also supported for both deposits and withdrawals, you are probably better off using Bitcoin for both, due to fast withdrawal times and $20 minimum limit that is in place for both deposits and cashouts. Check can also be used for cashouts, but we don’t like the fact that no electronic wallets are at your disposal for the time being. Accepting only customers from the United States, Cafe Casino can be a good option if you reside in this part of the world, offering some very good bonuses and the best games from Realtime Gaming and Rival Gaming. Bitcoin deposits and withdrawals will also come in handy, but the casino also needs to work hard on improving every aspect of their offer, since the site is far from easy to navigate, there is no banking info on the site apart from Bitcoin stuff, and live chat option is not supported.